Of the various administrative departments of the Islamic State, the Hisba is perhaps one of the most well-known. The Hisba's functions can be summarized in the Qur'anic concept of 'commanding what is right and forbidding what is wrong' (e.g. Qur'an 3:104). In other words, the Hisba's role is Islamic morality enforcement, including compliance with dress codes, the prevention of practices deemed un-Islamic such as selling and consumption of alcohol, and inspection of markets to ensure expired goods are not being sold. Of course, the Islamic State is not the only jihadist organization to have implemented the concept of Hisba on the ground. Prior to the invasion of Iraq, the Hisba was a feature of Ansar al-Islam's Islamic emirate project. However, the Islamic State's administrative organization of Hisba has been far more complex that of its predecessors. 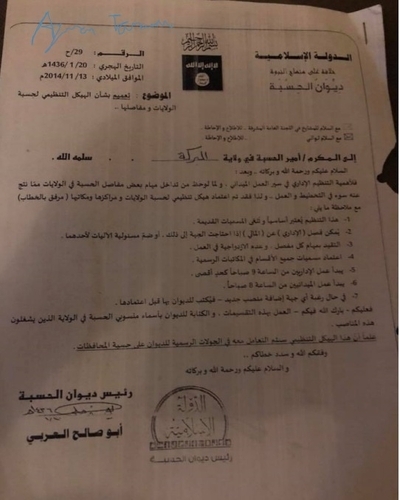 The Hisba department was one of a series of diwans (ministries/departments) of the Islamic State established after the announcement of the Caliphate. 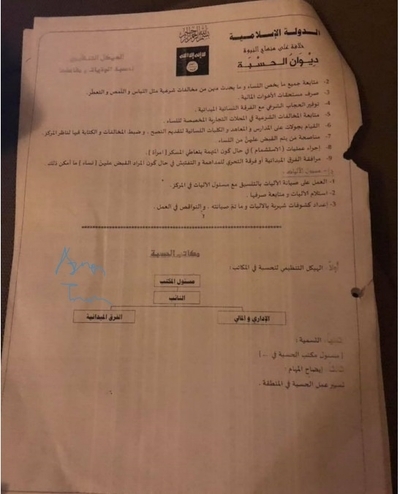 This does not mean of course that no concepts of Hisba existed in areas of Islamic State control prior to the Caliphate declaration: imposition of dress codes on women and the existence of a women's Hisba team, for example, were already on the ground in Raqqa city in the first half of 2014 prior to the Caliphate declaration. The Hisba is sometimes thought of as the Islamic State's 'Islamic police,' but documentary evidence from the Islamic State shows that this association is not correct. The Islamic police actually answers to the judiciary department of the Islamic State: the Diwan al-Qada wa al-Madhalim. Of course, the Hisba works with the Diwan al-Qada wa al-Madhalim in relevant cases for referral to the judiciary, but that does not make it the Islamic police. 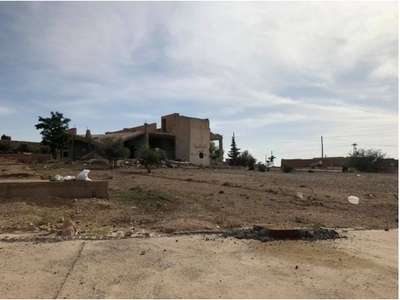 A destroyed Islamic State Hisba office in the Raqqa countryside. Photo by Aymenn Jawad Al-Tamimi, May 2018. Today, with the Islamic State's territorial control only a small fraction of what it held at the height of its success in 2014-2015, there is little room today for implementation of Hisba. After all, how can Hisba be implemented without populations to govern? As a result, within the Islamic State's original core of Iraq and Syria, implementation of Hisba is mainly found in an enclave that is Islamic State in everything but name: Jaysh Khalid bin al-Waleed, which continues to control a small enclave of territory on the border with the Golan Heights. Since it is unlikely the Islamic State will rise again to its previous peak of power, the evidence it left behind of its complex administrative system- including its Hisba apparatus- should be seen as a unique snapshot of history. The internal documents that I obtained from Syria and are the subject of this article concern the internal structure of the Hisba. 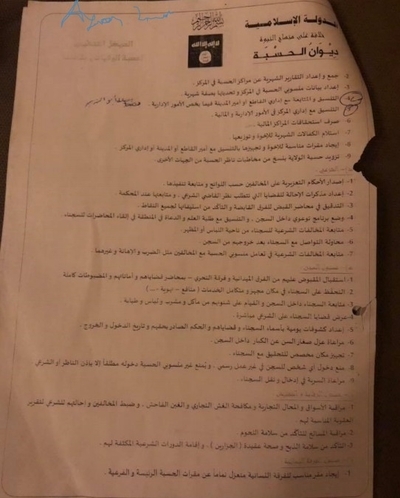 It appears that early on within the Islamic State's existence as the Caliphate, assignments of various elements of the Hisba apparatus were overlapping or being duplicated, leading to bad planning and operation. This problem led to the issuing of these documents to define more clearly the Hisba structure at the provincial and sub-provincial level. 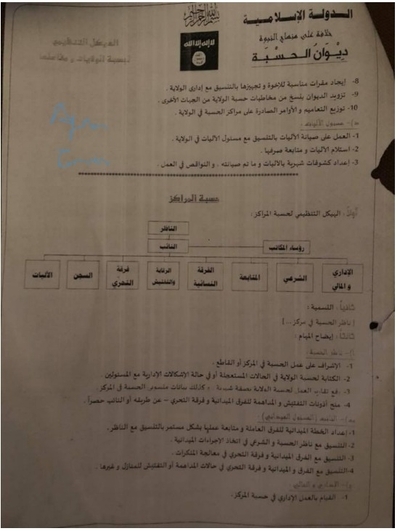 The documents show a typical case of Islamic State administrative structure in broader outline: that is, a greater Diwan X (ministry) and provincial branches of that Diwan (e.g. Diwan X of wilaya A) that communicate and coordinate with the greater Diwan. 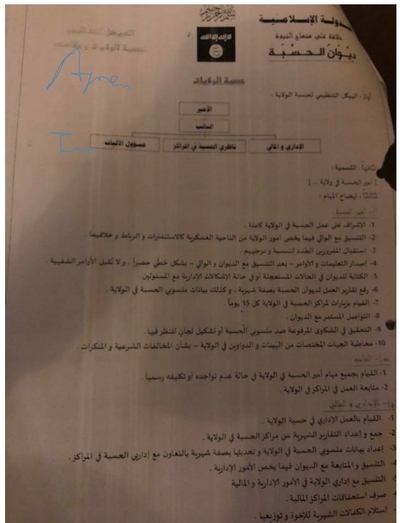 The name of Abu Saleh al-Arabi as head of the greater Diwan al-Hisba also turns up in a Hisba document from November 2014 outlining an exchange program for Hisba officials between various wilayas. Note the reference in these documents to the General Supervisory Committee. This was the general governing body of the Islamic State whose name was later changed to the Delegated Committee. The most important lesson to note from these documents is that they illustrate a case of how the Islamic State faced problems in governance and took steps to try to address those problems. It can be easy to be taken in by bureaucratic records at face value and imagine that somehow everything was in order. The documents appear below and are fully translated. Any explanations of terms are in square brackets. With regards to the mashayakh in the General Supervisory Committee- for review and acquaintance. With regards to the wali [provincial governor], for review and acquaintance. To the dear brother, the amir of the Hisba in Wilayat al-Baraka, may God keep him safe. 1. This organization is considered foundational, and the old names are to be cancelled. 2. 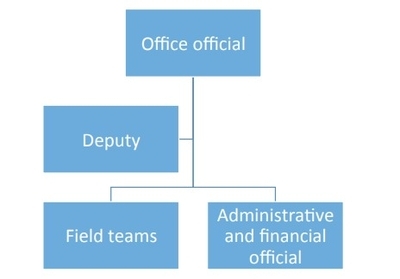 The administrative official can be separated from the financial official if the party requires that, or there can be inclusion of responsibility for vehicles to one of them. 3. Adherence to the assignments of each sector, and no duplication in work. 4. Adopting the names of all the divisions in official writings. 5. The work of the administrative officials begins from 9 a.m. at the latest. 6. The work of field personnel begins from 8 a.m.
7. In the event that a party wishes to add a new position, one must write to the Diwan about it before adopting it. So you- may God's blessings be upon you- must implement these divisions, and write to the Diwan with the names of the Hisba personnel in the wilaya who occupy these positions. Let it be known that this organizational framework will be dealt with in the Diwan's official tours of the Hisba of the provinces. May God grant you success and make right your path. Wa as-salam alaykum wa rahmat Allah wa barakatuhu. 1. Oversight of the work of the Hisba in the entire wilaya. 2. Coordinating with the wali in what concerns the affairs of the wilaya from the military realm like mobilizations, ribat and disagreement between the two of them. 3. Receiving those newly assigned to the Hisba and guiding them. 4. Issuing instructions and orders- after coordinating with the Diwan and the wali- in written form exclusively. Verbal orders will not be accepted. 5. Writing to the Diwan in urgent cases or in the event of administrative problems with the officials. 6. Referring reports on work to the Diwan al-Hisba on a monthly basis, and likewise data on the personnel of the Hisba in the wilaya. 7. Visiting the Hisba centres in the wilaya every 15 days. 8. Continual connection with the Diwan. 9. Verification in complaints raised against Hisba personnel or forming committees to review them. 10. Addressing the particular parties from committees and Diwans in the wilaya on the subject of Shari'i violations and condemned acts. 1. Undertaking all the assignments of the amir of the Hisba in the wilaya in the event that he is not present or is officially entrusted to do so. 2. Tracking work in the centres in the wilaya. 1. Undertaking administrative work in the Hisba of the wilaya. 2. Gathering and preparing the monthly reports about the Hisba centres in the wilaya. 3. Preparing the data on the Hisba personnel in the wilaya and updating them on a monthly basis in cooperation with the administrative officials of the Hisba in the centres. 4. Coordinating and tracking with the Diwan in what concerns administrative matters. 5. Coordinating with the administrative official of the wilaya in administrative and financial matters. 6. Paying out the financial benefits of the centres. 7. Receiving the monthly salaries and distributing them. 8. Finding appropriate bases for the brothers and preparing them in coordination with the administrative official of the wilaya. 9. Providing the Diwan with copies of communications with the Hisba of the wilaya from other parties. 10. Distributing statements for distribution and issued orders to the Hisba centres in the wilaya. 1. Working to repair vehicles in coordination with the vehicles official in the wilaya. 2. Receiving vehicles and tracking their usage. 3. Preparing monthly inventories on vehicles and what has been repaired, and the deficiencies in operation. 1. Overseeing the work of the Hisba in the centre or area. 2. Writing to the Hisba of the wilaya in urgent casesor in the event of administrative problems with the officials. 3. Referring reports on the work to the Hisba of the wilaya on a monthly basis, and likewise data on personnel of the Hisba in the centre. 4. Granting permits for inspection and assault to the field teams and investigation team, through him or the deputy exclusively. 1. Preparing the field plan for the operating teams and tracking their work on a continual basis in coordination with the overseer. 2. Coordinating with the Hisba overseer and the Shari'i in adopting field procedures. 3. Coordinating with the field teams and investigation team in resolving condemned acts. 1. Undertaking administrative work in the Hisba of the centre. 2. Gathering and preparing monthly reports about the Hisba centres [sic: offices?] in the centre. 3. Preparing data on the Hisba personnel in the centre and updating them on a monthly basis. 4. Coordinating and tracking with the administrative official of the area or the amir of the city in what concerns administrative matters. 5. Coordinating with the administrative official of the centre in administrative and financial matters. 7. Receiving monthly salaries for the brothers and distributing them. 8. Finding appropriate bases for the brothers and preparing them in coordination with the amir of the area or the city or the administrative official of the centre. 9. Providing the Hisba of the wilaya with copies of communications with the overseer of the Hisba from other parties. 1. Issuing reprimand rulings against violators according to the tables and tracking their implementation. 2. Preparing notices of referral to the judiciary that require the view of the Shari'i judge, and tracking them at the court. 3. Accuracy in the arrest teams' arrest reports and ensuring their completion in all points. 4. Putting in place an awareness-raising program inside the prison, and coordinating with students of 'Ilm and prechers in the area in giving lectures to the prisoners. 5. Tracking Shari'i violations by the prisoners in the realm of clothing and appearance. 6. Trying to keep in contact with the prisoners after they leave the prison. 7. Tracking Shari'i violations in how the Hisba personnel deal with the violators such as hitting, degradation and other things besides them. 1. Receiving those detained by the field teams and investigation team- with their cases' reports, their guarantees and things seized in their entirety. 2. Looking after the prisoners in a prepared place and complete with services (facilities, ventilation etc.). 3. Tracking the prisoners inside the prison and looking after their needs from food, drink, clothing and medical matters. 4. Displaying the prisoners' cases to the Shari'i directly. 5. Preparing daily lists of the names of the prisoners, their cases, the judgement issued regarding them and date of entry and exit. 6. Ensuring the separation of the young from the old inside the prison. 7. Preparing a specified place for verification with the prisoners. 8. Preventing the entry of any person into the prison in unofficial work, and those not affiliated with the Hisba are absolutely barred from entering except by permission of the overseer or the Shari'i. 9. Ensuring secrecy in inserting and transferring prisoners. 1. Overseeing the markets and shops and preventing market swindling and monstrous fraud, and catching violators and referring them to the Shari'i for a report of the appropriate punishment for them. 2. Overseeing the slaughterhouses to ensure the safety of the meats. 3. Being sure of the safety of the slaughter and soundness of the creed of the butchers, and establishing intensive Shari'i courses for them. 1. Finding an appropriate base for the women's team completely separate from the principal and divisional Hisba bases. 2. Tracking all that concerns women and what happens from them Shari'i violations like clothing, suckling and perfume. 3. Paying out the financial benefits of the sisters. 4. Making available the Shari'i hijab with the women's field team. 5. Tracking Shari'i violations in the shops specified for women. 6. Undertaking tours of the women's schools, institutes and colleges to offer advice, and stopping violations and writing about them to the overseer of the centre. 7. Counselling the women who are arrested. 8. Carrying out operations of sniffing in the event that the woman is accused of intoxicant [alcohol] consumption. 9. Accompanying the field teams or investigation team for assault and inspection in the event that the goal is to arrest women as far as possible. 1. Working to repair the vehicles in coordination with the vehicles official in the centre. 2. Receiving vehicles and tracking their use. 3. Preparing monthly lists of the vehicles and what has been repaired, and the deficiencies in operation. 1. 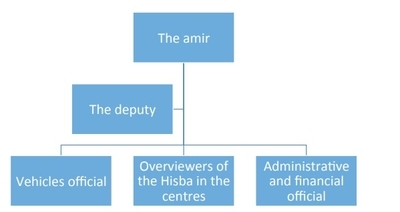 The organizational framework for the Hisba in the offices. Managing the work of the Hisba in the region.